Production is getting ready to roll out for Transformers 4, and a sneak peak at the sequel from director Michael Bay has just surfaced. Before we get to the photos though, one more name has been added to the cast which already has Mark Wahlberg in the lead with Nicola Peltz as his daughter, Jack Reynor as her race car-driving boyfriend, and supporting cast members like Stanley Tucci, Kelsey Grammer (as a villain) and Sophia Myles. Now THR has word that Cloverfield and She's Out of My League star T.J. Miller will be playing Wahlberg's best friend, a fellow mechanic. So how about these first look photos? That first car is a Bugatti Veyron Grand Sport Vitesse, and word on the street is that this is new vehicle form for Drift. 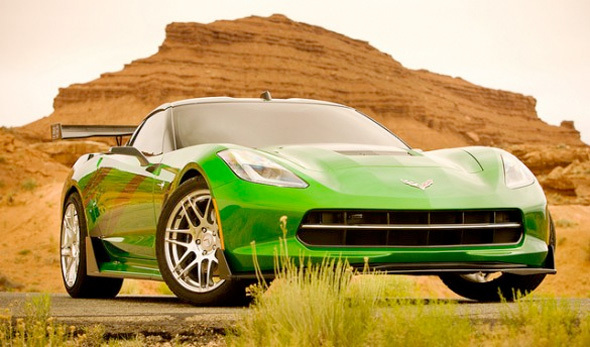 The car is perfect for Transformers 4 with a 1,200 horsepower engine and a top speed of 255 mph. Meanwhile, that second car is one we expected to show up in the sequel, and that's the new C7 Corvette Stingray. This vehicle will supposedly be the new form of Slingshot, and Chevy is surely hoping people will want to buy the new Transformer when the car goes for sale next year, just in time for the movie's release. It's a much more sleek. 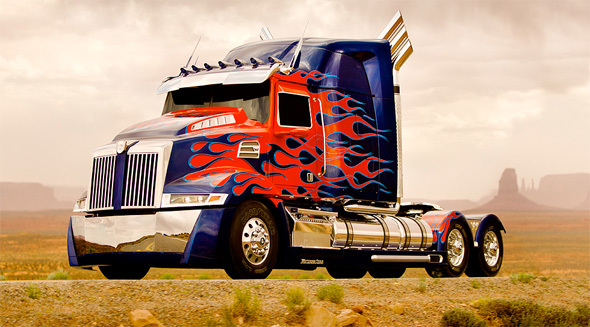 The truck is a completely custom version from Western Star. The real question is what does this redesign mean for how Optimus Prime will look when he transforms into his robot form? What cool weaponry and goodies does the new vehicle form allow for in the sequel? We'll have to wait until next summer to find out when Paramount Pictures sends Transformers 4 to theaters on June 27th, 2014. Looking good?